November 1, 2018, 7:00 PM · Halloween's over, which means it is time to move on to Christmas at the nation's theme parks. Here is when holiday events will kick off at several popular parks, and what you can expect from each event. The Branson, Missouri park kicks off the theme park holiday season this year, with six and half million lights decorating the park. Highlights include a five-story Special Effects Christmas tree, an evening light parade, two Broadway-style original musical productions, and 1.5 million LED lights in the one-acre Christmas in Midtown display. If you miss Disney's Osborne Family Spectacle of Dancing Lights, this is where you want to go this holiday season. 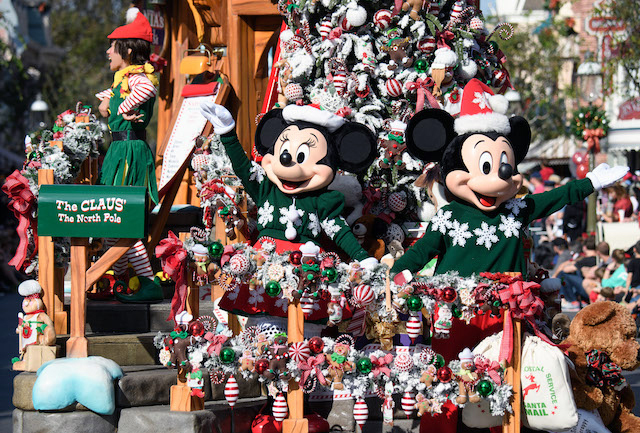 The upcharge Mickey's Very Merry Christmas Party starts its run one week from today, but daytime guests can enjoy the holiday decorations every day at the Magic Kingdom through the start of the New Year. At Disney's Hollywood Studios, Sunset Seasons Greetings projection show returns, as does the Jingle Bell, Jingle BAM! fireworks. Disney's Animal Kingdom is celebrating Diwali (the holiday Festival of Lights in India) this year, in the new Up! A Great Bird Adventure show. At Epcot, the Festival of the Holidays food and drink event starts November 18, following the conclusion of the Epcot International Food & Wine Festival on November 12. IllumiNations gets its holiday finale, and the Candlelight Processional show in the America Gardens Theater runs from November 22 through December 30, with three shows nightly featuring a live orchestra, choir and celebrity narrators. Disneyland — November 9 - January 6, 2019. Festival of the Holidays continues through January 8, 2019. The Haunted Mansion Holiday overlay continues from Halloween at Disneyland, while the It's a Small World Holiday returns, joining the Believe...in Holiday Magic fireworks and A Christmas Fantasy parade. At Disney California Adventure, the Festival of the Holidays offers 12 food and beverage marketplaces serving holiday fare from around the world. (Disney released the menus today.) New items include Turkey & Stuffing Tamale with Cranberry Relish, Lox & Everything Bagel Nachos, Pumpkin Soup with Maple Cashew Cream, and Shrimp and Grits with Andouille Sausage. The Three Caballeros also host Disney ¡Viva Navidad! and Cars Land's two flat rides transform into Luigi's Joy to the Whirl and Mater's Jingle Jamboree. Finally, Santa welcomes guests at the Redwood Creek Challenge Trail through Christmas Eve. Santa Goofy takes over after Christmas morning because, well, he's Goofy. Dollywood has added more than one million lights to its Glacier Ridge expansion of Smoky Mountain Christmas this year, which will feature a 50-foot Christmas tree, a recreation of the northern lights and a return for the park's musical productions, including Christmas in the Smokies, It’s a Wonderful Life, and 'Twas The Night Before Christmas. The Parade of Many Colors also returns. The Merry Christmas, Snoopy! ice show returns at the Charles M. Schultz Theatre on select dates, along with the It’s the Merriest Christmas Show Ever, Charlie Brown. In Camp Snoopy, the A Peanuts Guide to Christmas show plays daily. Charles Dickens’ A Christmas Carol and O. Henry’s A Gift of the Magi will play on select dates in the Bird Cage Theatre, which also will host Krazy Kirk and the Hillbillies. Santa will greet kids in the Wilderness Dance Hall in Ghost Town, which becomes Santa's Christmas Cabin for the holidays, also serving a variety of themed treats, including a Cheesecake "Tree" on a Stick, dipped in chocolate and crushed peppermint candy. Ghost Town also will host a "Snow and Glow" experience nightly every hour from sunset until park closing. 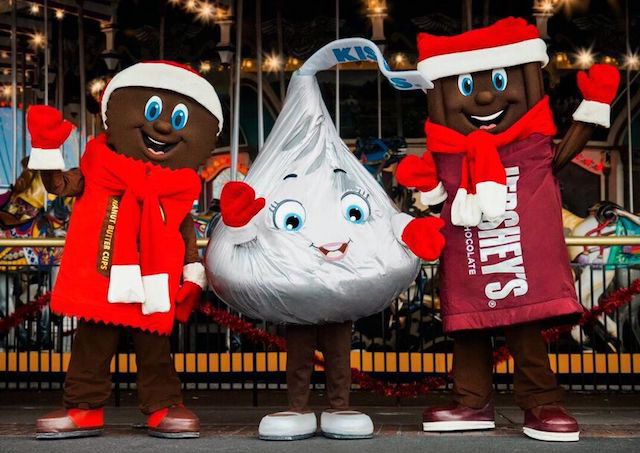 Celebrating its 35th anniversary, Hersheypark's Christmas event will feature four million lights decorating the park, along with the NOEL light show, Up on the Rooftop musical, a meet and greet with Santa and his reindeer, plus hot chocolate, S'mores, and other sweet holiday treats for sale. The Magic of Christmas at Hogwarts Castle projection show returns at Islands of Adventure, as does the Universal's Holiday Parade Featuring Macy's at Universal Studios Florida. Grinchmas also returns at IOA, as does Mannheim Steamroller on select nights at USF. The Magic of Christmas at Hogwarts Castle also plays at the Wizarding World in Hollywood, which will add nightly snowfall in Hogsmeade this year. Grinchmas returns to the Universal Plaza on December 1 - 2, 8 - 9 and 14 – 30. SeaWorld adds a Dine with Santa at Shamu Stadium buffet this year, with prices starting at $40. Elsewhere, the O Wondrous Night live nativity returns, along with the Sea of Trees, Winter Wonderland on Ice, the Sesame Street's Elmo's Christmas Wish show, Clyde & Seamore's Countdown to Christmas, Pets Ahoy Christmas, and the Shamu Christmas Miracles performance. Rudolph's ChristmasTown and The Christmas Market also return this holiday season, which extends into the New Year with the Three Kings Celebration. The new "Christmas Is..." contemporary musical show at Dragon Fire Grill joins the line-up this year, which also features Rudolph's Winter Wonderland, the Sing-A-Long Train, Christmas on Ice, Elmo's Christmas Wish, the Holiday Hills Band, and the Carol of the Bells light show. Also new is Brunch with Santa, which includes unlimited mimosas or "build your own Bloody Mary" upgrades for the grown-ups. Magic Mountain caps off its first year of every-day operation with an expanded holiday event, which includes light displays, Santa's workshop, holiday-themed live entertainment, and seasonal treats for sale. Rudolph’s Movie Experience debuts in the Mission Bay Theater this year, joining Rudolph's Christmastown, Santa's Christmas Village, Clyde & Seamore’s Christmas Special, the Dolphin Island Christmas show, and O Wondrous Night, The Greatest Story Never Told — the Christmas story told through the eyes of the animals, including camels, a donkey, llamas, sheep and doves. Overlooking it all is the 320-foot Skytower Tree of Lights, the largest "Christmas tree" in Southern California. What is your favorite theme park holiday tradition? Please tell us about your favorite events, in the comments. SeaWorld Orlando is my personal favorite for the holidays. All of the shows get holiday makeovers and the whole park is decorated. Not to mention the holiday food and beverage samplers available. 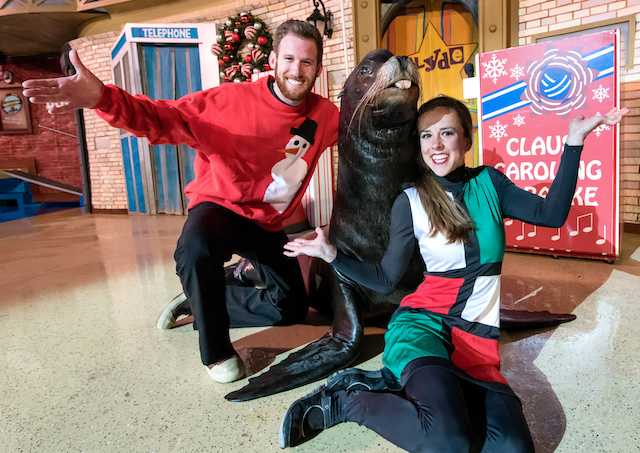 SeaWorld has really gone downhill over the past few years, but it's Christmas offering was outstanding. The lights, musical street performers, food stalls, few shows, was a real surprise. I like Universal Orlando a lot. Love the Blues Brothers and the Celestina Warbeck show make overs. You didn't specifically mention Christmas Town in Busch Gardens Williamsburg, but that's our favorite. The lights and decorations are beautiful. It really gets you in the Christmas spirit. Look forward to going in early December. I'm going to second James' vote for SeaWorld Orlando. They have tons of lights, O Wonderous Night is amazing (as is Winter Wonderland on Ice) and the best part is that it's included with park admission. There's no place as festive and beautiful as the Magic Kingdom during the holidays. Have to give Disneyland a nod as the holiday overlays for Haunted Mansion and Small World are great. Still miss the Osborne Lights at the Studios, that was always a great place to experience. I've said it before and I'll say it again - SeaWorld Orlando is pretty hard to beat. The progression of shows starting with Shamu then to the Sea of Trees as you make your way to the Holiday ice skating show then the big fireworks show to cap off the night is a really amazing night of programming. Dollywood is also spectacular, although a tad heavy handed on religion in my opinion. No denying Disney and Universal also have outstanding decorations and shows as well, but I think it's a shame that the Magic Kingdom holds out on some of the holiday programming to hard ticket events. At least at Disneyland they run the Christmas parade for day guests the whole season. I believe it's only presented during day operation the week before Christmas in Orlando. When it comes down to it, I still think SeaWorld Orlando and Dollywood give me the greatest Holiday feels. I'm kind of burnt out on the "Christmas On Steroids" approach at the Disney parks. Subtly has become a lost art with them. I'll give it to Knott's and Dollywood. They both do a great job and are loaded with charm when it comes to Christmas. SeaWorld Orlando is my favorite place at Christmas. You cannot help but be filled with Christmas spirit. O Wondrous Night is one of the most original (and moving) Christmas productions I have seen in quite some time. I can’t help but wonder how long they will be able to continue to celebrate the birth of Christ and display “Merry Christmas” before someone decides it is offensive to them and they have to shut it down. As long as they are able to continue, I will be there, every, single, Christmas season. So, referencing the poll results .... Disney wins ... By a lot .... Again. ^Well, at least SeaWorld wins amongst the commenters. I enjoy Disney's holiday offerings, but I dislike the idea of upcharging the event. Of course, people keep going every year, so why should they stop?